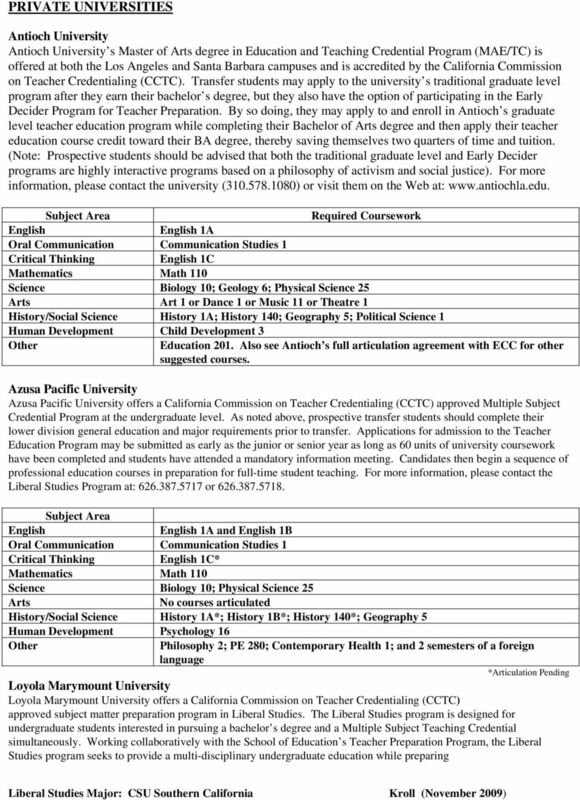 Download "LIBERAL STUDIES MAJOR TRANSFER REQUIREMENTS"
3 California State University, Northridge CSUN presently offers two undergraduate teacher preparation programs for transfer students who plan on becoming elementary or special education teachers: the Pre-Credential Option and the Integrated Teacher Education Program (ITEP) Junior Option. The Pre-Credential Program allows students to earn a Bachelor of Arts degree in Liberal Studies only and is best suited for individuals who wish to enroll in a teaching credential program after they earn their BA degree. The Integrated Teacher Education Program is designed for students who wish to earn their Bachelor of Arts degree and their credential simultaneously. All students begin in the Pre-Credential Program but may join ITEP in their junior year. Students may apply to ITEP as early as their first semester at CSUN. 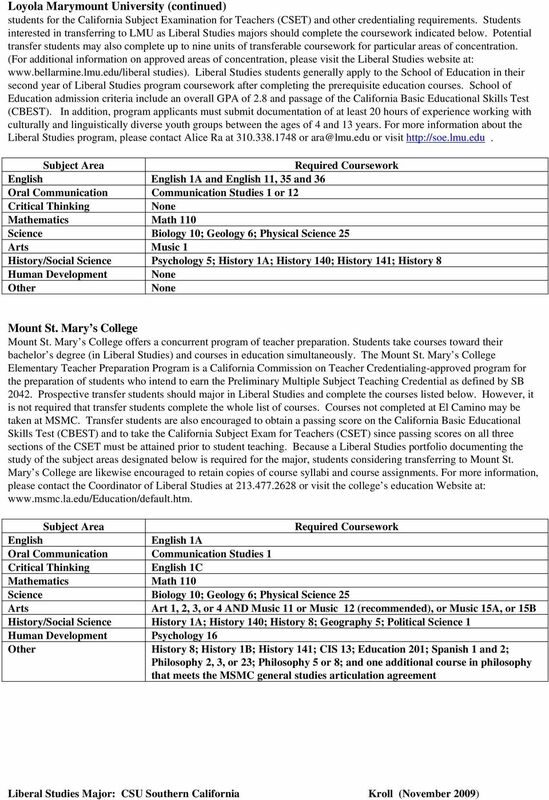 For more information, please visit the Liberal Studies Website at : or call A and one from 1B, 15A, 15B, 35, 36, 40A, 40B, 42, or 43 1C or Philosophy 5 or 8 or Psychology 3 Science Biology 10 and Geology 6 and Physical Science 25 Arts One from: Art 2, 3, 4, 9 or 5A or Dance 1 or Music 11 or Theatre 1 or 8 History/Social Science History 1A or 16A or 17; History 140 (formerly History 3); Geography 5; Political Science 1 Human Development Child Development 103 One from Anthropology 11, 30; Humanities 1, or Philosophy 2, 3, 7, 10, or 11 San Diego State University San Diego State University currently offers two routes to obtaining the Multiple Subject Teaching Credential: (1) the traditional pathway where students earn a bachelor s degree in Applied Arts and Sciences and then enter the teaching credential program; and (2) the integrated pathway where students earn the bachelor s degree and the teaching credential concurrently. At the time of admission, all students will be placed in the pre-traditional major. Thereafter, they may choose to pursue the integrated or traditional pathway. 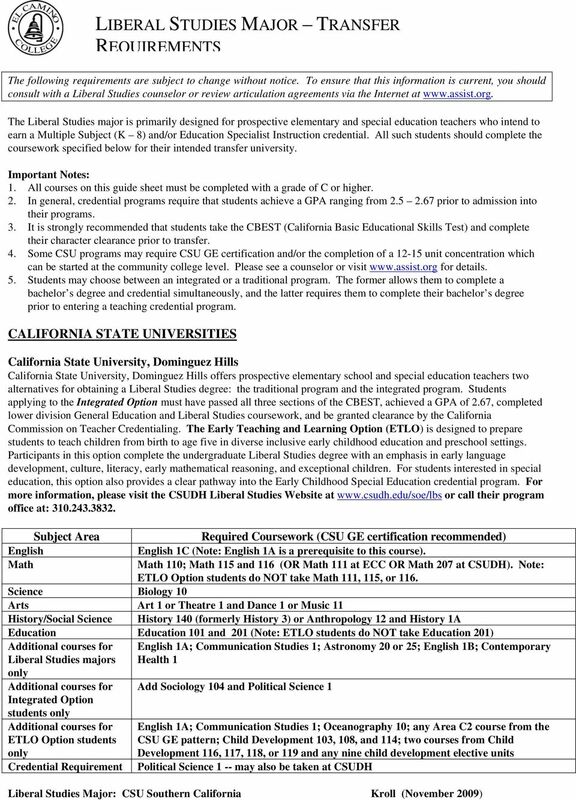 (Note: CSU GE certification is included within the major, so students should not follow the California State University General Education Certification or IGETC plan). For more information, please visit their Website at call: A and 35, 36, or 1B, 3, 4, or 12 1C or Philosophy 5 or 8 or Psychology 3 or Speech 4 (if not already taken) and 116 Science Biology 10 and Geology 6. Physical Science 25 may also be taken as an elective. Arts Art 1 or Theatre 4 or Music 7 History/Social Science History 140 (formerly History 3) and Geography 5 and one from: History 1A, History 1B, History 9, History 16A, History 16B, or Political Science 1 Human Development Child Development 3 or Psychology 5 and 16 Education Education 201 (Note: Education 101 is a prerequisite to this course). If three years of a foreign language was taken in high school, take Philosophy 3. If not, take Chinese 2 or French 2 or German 2 or Italian 2 or Spanish 2. 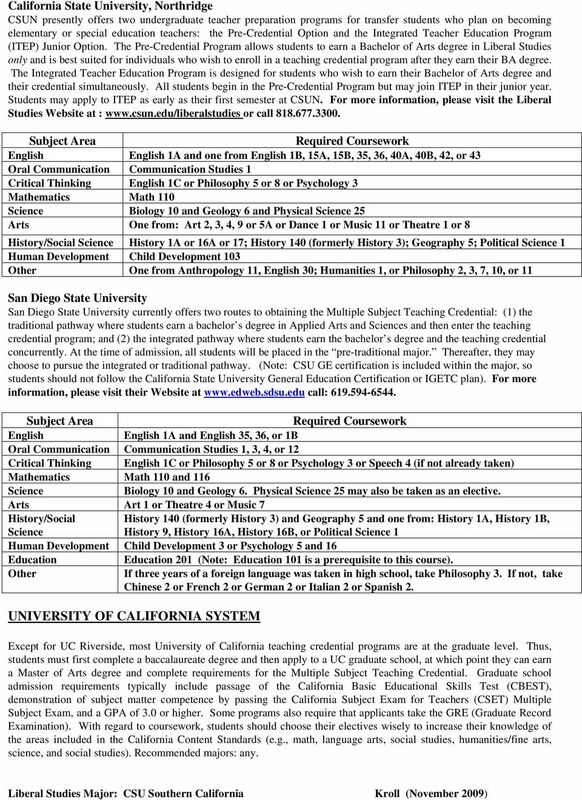 UNIVERSITY OF CALIFORNIA SYSTEM Except for UC Riverside, most University of California teaching credential programs are at the graduate level. Thus, students must first complete a baccalaureate degree and then apply to a UC graduate school, at which point they can earn a Master of Arts degree and complete requirements for the Multiple Subject Teaching Credential. 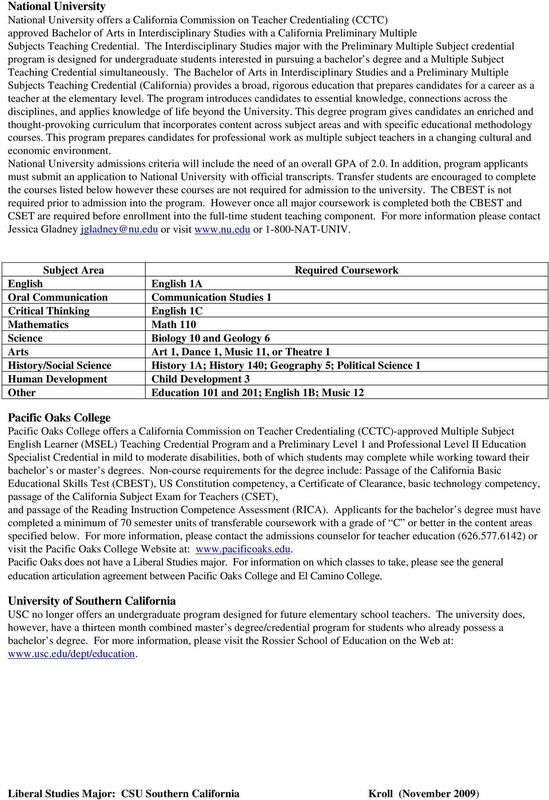 Graduate school admission requirements typically include passage of the California Basic Educational Skills Test (CBEST), demonstration of subject matter competence by passing the California Subject Exam for Teachers (CSET) Multiple Subject Exam, and a GPA of 3.0 or higher. Some programs also require that applicants take the GRE (Graduate Record Examination). 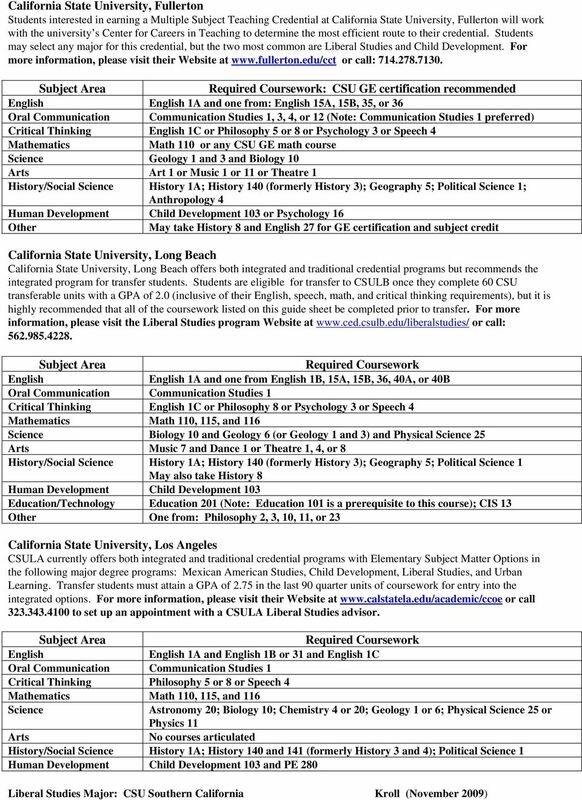 With regard to coursework, students should choose their electives wisely to increase their knowledge of the areas included in the California Content Standards (e.g., math, language arts, social studies, humanities/fine arts, science, and social studies). Recommended majors: any. Is Teaching for You? Take steps to confirm that this is the right career choice for you.